This Mars Global Surveyor (MGS) Mars Orbiter Camera (MOC) image shows a view of frozen carbon dioxide in the south polar residual cap of Mars. 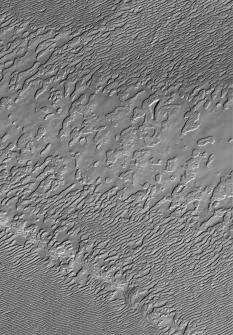 Much of the south polar residual cap exhibits terrain that resembles stacks of sliced Swiss cheese, but this portion of the cap lacks the typical, circular depressions that characterize much of the region. Carbon dioxide on Mars freezes at a temperature of around 148 Kelvins, which is -125°C or about -193°F.